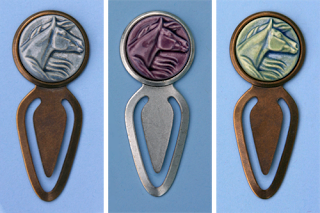 I stocked the Etsy store with several colors of the Arabian Mare bookmark today, and was tickled to find someone had put the slate blue one (to the far left) in a “Treasury” listing. Those are groupings of items users pick out from the site, usually following a theme, to display on the front page of the site. Unfortunately I haven’t yet figured out how to link those directly to the blog, but it was neat to see it there. 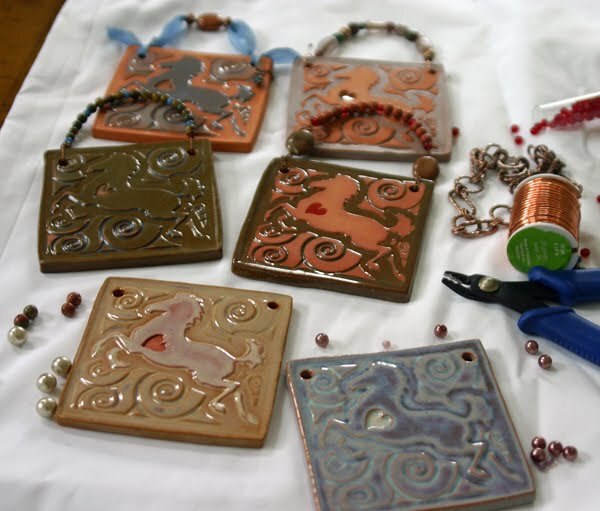 I’m still in the process of listing some of the pendants and tiles. I thought it would be a good idea to get them up in time for folks that do their holiday shopping early! 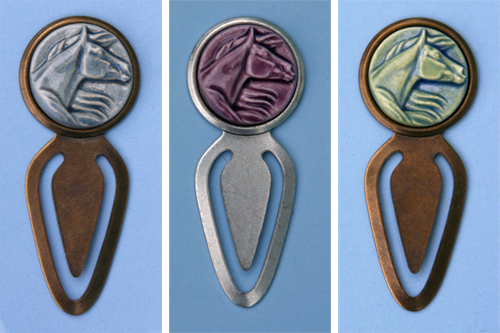 I’ve also in the process of updating the website with pages for the giftware. There has actually been a fair bit of it made here over the years, but a lot of it has never been seen since I tend to make it for my own gift-giving! I’ve also started formalizing my glaze colors and giving them names. I’ve had people ask me to glaze something to match an earlier piece and realized that unless I named the color formulas, we’d all have a hard time knowing which blue or which green was wanted. After laughing at the exotic names people sometimes give to product colors, I now have a new appreciation for how difficult it is to come up with a name that gives the buyer a good idea of the tone without sounding too generic and bland or too over-the-top and silly. Oddly enough, that did work a lot better. It was also fascinating, because the terra cotta altered the glazes in unexpected ways. My favorite was this one. 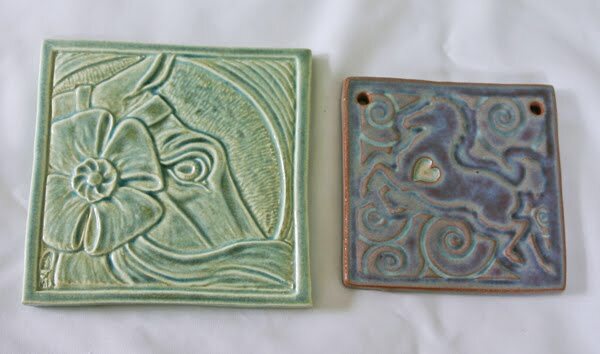 The tile to the left is Lynn Fraley’s “In The Ribbons”. It was cast in white earthenware and glazed with my favorite sea-green glaze. 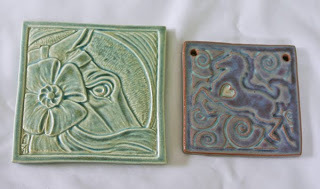 The Flying Heart tile to the right has the exact same glaze. The only difference is that it was cast in terra cotta. 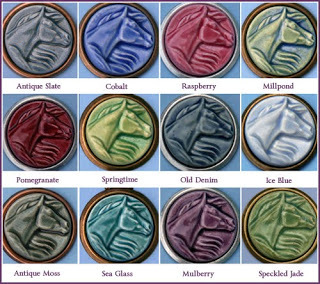 The oxide in the clay turned the colors to blues and purples. What isn’t visible in that photo – indeed I haven’t been able to capture it in any photo – is that the high areas where the terra cotta coloring shows through don’t actually look red-brown. They look like copper, including a slight glittery effect. I found that some of my translucent glazes sometimes gave an even more pronounced metal-flake glitter look. Others had pigment that clustered most densely in small dots. What’s more, if I fired the tiles a second time the colors changed again. It was a lot of fun, but it certainly gave me a new appreciation for just how reliable the underglaze colors really are.